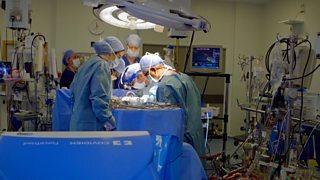 Surgeon Gabriel Weston witnesses one of the most extraordinary surgeries carried out in the UK, at Papworth in Cambridge. Blood clots can form inside vessel deep within our lungs, causing lots of fibrous material to build up and restrict the blood flow. In the past, the only treatment would have been a full lung transplant. A clot deep within a main vessel in the lungs is almost impossible to remove, with all the blood flowing through. But at Papworth, they provide a radical solution. To get to the clot the surgical team, led by surgeon Mr David Jenkins, drain all of the patient’s blood from their body. This means stopping the heart, and pumping all the blood in the body into a vat in the operating theatre. Without the blood flowing, they are able to remove the fibrous material that is causing the problem. But, without the blood flowing, the patient’s brain is not getting any oxygen and under normal circumstances brain damage occurs after just two minutes without oxygen. To give the team a longer window to operate they take another remarkable step: they cool the patient’s body from the normal 37 degrees to just 20 degrees. At this cooler temperature the brain function slows down and so the brain can survive for twenty minutes. But after 20 minutes, the surgeon must stop his work and allow the patient to have their blood returned to their body and then warmed up, so that the brain can receive vital oxygen. After about half an hour, the whole procedure can be repeated to allow the painstaking surgery to continue. The surgery lasts for many hours and in this time the team have to drain the patient’s blood repeatedly to give them enough time to remove the fibrous material. But once the clot has been removed, the patient will be able to recover fully, and return to a normal life.